On Sunday morning, I awoke to an incredibly beautiful, and warm (mid 40s) day. I couldn't let one more day pass without going up to the Mountain to ride the new lift, see our new Patrol Station (now dubbed, "Taj Mahal), and ski for the first time this season, my ninth as a member of the Mt. Mansfield ski patrol. I was so taken with the ride, station, the warmth, and the views, that I completely forgot to snap some photos to share with you! Stowe Mountain Resort has replaced the FourRunner chairlift on Mount Mansfield with a new high-speed detachable quad. 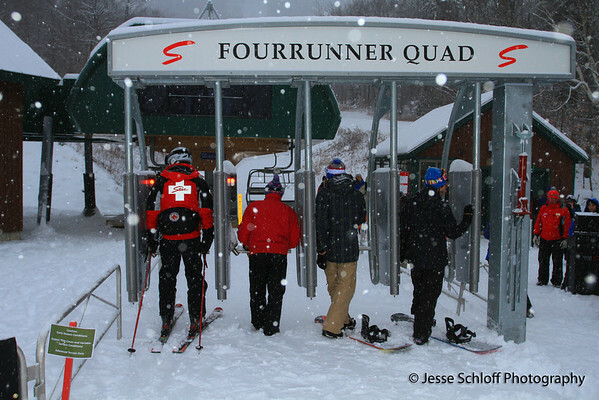 Originally installed in the ’80s, the FourRunner has been Stowe’s most popular lift, uploading more skiers and riders than any other lift in the resort’s history. Now, amidst a winter experience that’s second to none in the Northeast, access to the greatest variety of terrain east of the Rockies will become even more seamless with a new state-of-the-art quad on Vermont’s highest peak. The new lift will debut for the 2011-2012 ski and ride season. Stowe Mountain Resort is rich in ski resort history and one of the original four-season destinations in the United States. As far back as 1857, when H.H Bingham constructed a hotel atop Mount Mansfield, visitors have been traveling to Stowe for a world-class, high-quality experience that is both authentic and one-of-a-kind. Setting new standards for guest service and amenities in New England for well over a century, Stowe Mountain Resort has, since 2005, been reinforcing its brand with vast improvements and additions to mountain operations and slopeside amenities. Spruce Peak at Stowe - A new slope-side community that is well underway at the base of Spruce Peak and Mt. Mansfield. The intimate alpine neighborhood boasts enviable properties for purchase, an 18-hole golf course, dining, retail, esplanade and more. Spruce Camp Base Lodge - Stowe Mountain Resort’s central source for skier and snowboarder services. Stowe Mountain Lodge - The 312 room luxury lodge has established a new alpine aesthetic that celebrates rustic Vermont-Alpine architecture and the artisan traditions of New England. Spruce Peak Performing Arts Center - The 420-seat multipurpose theatre presents live and multimedia performances including theater, music, dance, variety, film, and much more. The Spa at Stowe Mountain Lodge - A luxurious 21,000 square foot world-class spa featuring distinctive services themed around the changing seasons of Vermont. York Fully-Automated Snowmaking - Creates a perfect snowstorm with the click of a button. From one computer, a snowmaker can control all the snowmaking hydrants on the system. Snowmaking is also enhanced with a new 100 million gallon pond. Intermountain Transfer Gondola – New transportation gondola provides access between Mount Mansfield and Spruce Peak in less than two minutes and eliminates the need to drive around the resort. Sensation Quad – New high-speed detachable lift delivers skiers & snowboarders to the summit of Spruce Peak in six minutes. Sunny Spruce Quad – New high-speed detachable lift provides access to most of the resort’s beginner trails and learning areas. Ride time is less than five minutes. Adventure Triple – New beginner lift for adults and children. This lift provides access to an entirely new beginner trail named ‘Inspiration.’ The low-riding lift and consistent twelve degrees of pitch provide the ideal learning terrain and environment. Main Street – The premiere alpine racing trail in New England and the host of the 2011 NCAA National Skiing Championships.